Another So-Saree Reader speaks today. Today's Reader happens to be an ex-colleague of mine. Back then, I knew her as the girl in our office who wore sarees as everyday office wear. No points for guessing..I fell in love with her right then. But then we never really interacted. We actually got back in touch and hit it off well after we both quit our jobs and started blogging. Yup..We are Blog Sisters...if that, even is a terminology. Today she is here to share her Saree Love. Aditi and I were working in the same organization, but we never spoke to each other. Like me, she too loved Sarees and this made us connect instantly! She would be the only one excited to wear a Saree, during festivals in office. I loved the way she draped the saree and accessorized it with simple and beautiful jewellery. When she left the organization to become an entrepreneur, my respect for her increased even more...Very few people gather the courage to take the road less traveled. Somewhere, she inspired me to follow my heart too! I am so happy to see her growing in her chosen field, successfully! I’ve been following So-Saree from last year and I admire Aditi’s patience. Her nail-arts are the best. I too hope one day to try some of them. As of now, I just want my nails to grow. Any tips on that, welcome! I was in school, when I first wore a saree. It was our annual day and the theme was ‘National Integration’. 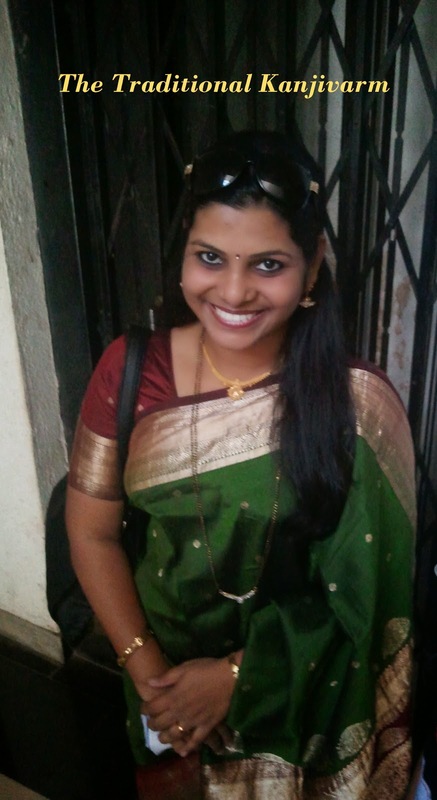 Though I don’t have the pictures of, I remember how excited I was to wear a saree. As I grew up, my love for sarees increased. I would eagerly wait for festivals like, Vishu, Onam, Ganesh Chathurthi, Navratri and Diwali. I learnt the art of draping the saree, from my step-mom. She believed that a Saree enhances the beauty of a girl. Sarees do accentuate your curves when draped efficiently. I have a huge collection of sarees, right from the traditional Paithani, Kanjivaram, Dharmavam, Banarsi Silk to simple Chiffon everyday wear. While I was working, I ensured to wear saree at least once in a week. I traveled in the Mumbai local trains and trust me it is quite challenging to wear a saree amidst such crowd. I prefer to wear chiffon sarees during rainy season, as they dry very soon. My personal favourite are Kanjivaram, Kerala cotton and Coimbatore cotton silk sarees. Though I love sarees, I don’t enjoy shopping for the same. Most of my collection is either gifted by my dad or my husband or mother-in-law. I am lucky, for they choose the best for me! I like wearing simple accessories, mostly pearls or a gold necklace with the traditional ones. With chiffons, I prefer, long earrings and a smart bracelet. I love to add colorful glass bangles as well, as they enhance the beauty...even more. Thank you Gayatri for this wonderful post. You can follow Gayatri on Twitter and she blogs on Outside the Kitchen Window and Pacman's Foodie Venture. Do check her blogs out. she sure wears her saree well!! I'd love to learn a nice drape soon. Thank you Style :) You made my day!! bhagalpuri silk sarees online shopping comes under the category of traditional sarees and are mostly liked by Indian women. Thanks for the info. I've never won a saree but I've always thought they are so beautiful. The ones you shared are so amazing! Thanks for sharing:) I invite you to visit my blog and let me know if you would like to follow each other to stay in touch.